On 28 June 2009 4.30 til 5.30 in the Jeruzalem church, a dawn service ‘Heilige Bonen’ was held as a sanctification for all the plants which are growing wildly, autonomously and unwantedly around the church. On 28 June 2009 from 4.30 til 5.30 in the Jeruzalem church, a dawn service ‘Heilige Bonen’ was held as a sanctification for all the plants which are growing wildly, autonomously and unwantedly around the church — between the church fence and the public square which abuts the church garden. 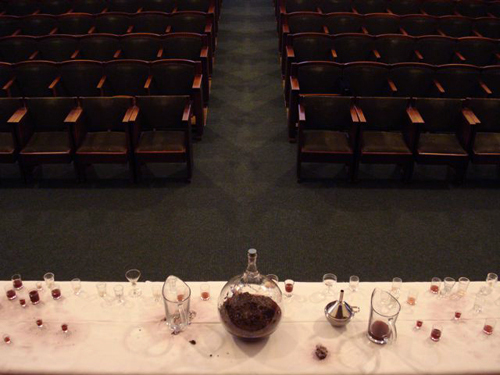 ‘Sacrament for the unwanted plants’ was one performance as part of the service. In the months leading up to the dawn service, 3 Amsterdam-based artists took these plants as the basis of a sacrament, an ode to the plants which involved a plant libretto sung by the church choir accompanied by organ, a poetic prayer for plants performed by the priest, and a bloodwine made from a maceration of all the church weeds drunk at the close of the dawn service. Organised by Foam lab Amsterdam together with the artists Annet Blut, Christina della Giustina and Wietske Maas in co-operation with the Jeruzalem church, Amsterdam. This entry was posted on Sunday, June 28th, 2009 at 08:17 and is filed under Project posts. You can follow any responses to this entry through the RSS 2.0 feed. Both comments and pings are currently closed.